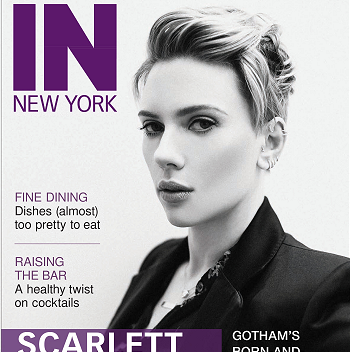 Interview Magazine posted their list of the 20 most beautiful people of the decade and Scarlett hits it at #8. Click on the link here to see a lovely photo of Scarlett from 2003 and read a short interview with her that was probably given around the same time period. Previous Post‘A View From the Bridge’ previews beginning soon! Here Is The Text From The Interview Web Page. I Wish I Could Include The Photo. It Is Very Good. Since that first shot of Johannsson in Lost in Translation, her throwback beauty has been bewitching us. The red lips against porcelain skin, the platinum curls, the breathy voice, the curves—she’s Marilyn all over again, but brainier this time around. She can even sing, as she proved with her album of Tom Waits covers in 2008. Recently wedded to Ryan Reynolds and seemingly over being Woody’s ingenue, Scarlett Johansson still remains the ultimate Muse. GRAHAM FULLER: Are you happy in your personal life? SCARLETT JOHANSSON: I can’t complain. I’ve been in two very long relationships, and now I’m single for the first time since I started dating, and you learn so much about yourself. Being in a relationship is great because you compromise and make decisions together. But after doing that for so long I felt I needed to be alone. I like to make my own choices. FULLER: You’ve got plenty of time for love. JOHANSSON: I know. You can’t really search it out. I’ve met a lot of assholes. But I’m really happy that those assholes have helped me define what I want and what I don’t want. [laughs] I guess you’ve got to meet a lot of different kinds of people-people that are just plain wrong for you, people that seem great, people you have a crush on-so that when the right person does come along, you know it for sure. FULLER: You’ve got to kiss a lot of frogs before you meet the right prince. JOHANSSON: Or kiss a lot of assholes before you meet the right guy. That’s been my experience so far.